With Parliament deadlocked over Brexit, I took a look at the different factions of MPs and did some number-crunching on the @OpenEurope blog. There may not be a majority for May's deal, but don't write it off yet. 1. 🇳🇴➕ #NorwayPlus is often championed as a compromise which could win a majority. Is this true? I could only find 22 MPs who publicly back it. 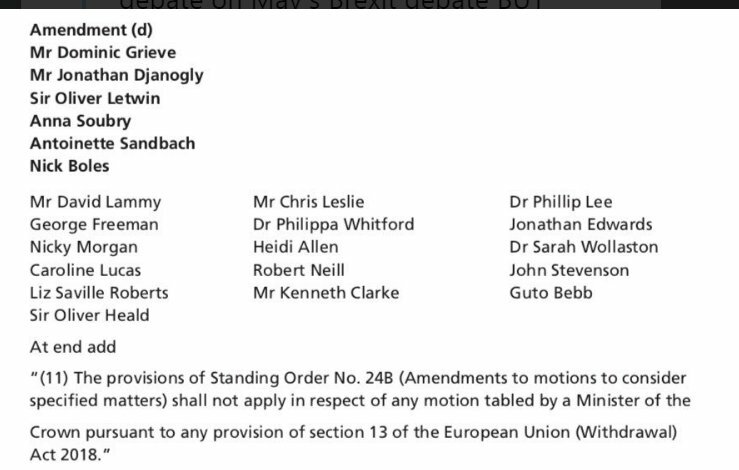 15 Conservatives, 5 Labour, and 2 ex-Labour Independents (Frank Field and Ivan Lewis). It's not many people's first choice. 2. Now of course, the argument for #NorwayPlus is that, while it's not many people's first choice, it's a compromise Parliament can unite behind. I think this argument is shaky. Section 13 of the EU Withdrawal Act provides for several motions in neutral terms, which become amendable if 24B is disapplied.